In my first year as the Head of Outdoor Education at Brighton Grammar, I have learnt that BGS not only talks about a three-cornered learning partnership (school, student, parent), but it continuously works towards the mutual benefit of all three partners. Embracing this partnership, I had the pleasure of meeting with the BGS Parents Association to hear about how they engage with the Outdoor Education program. It was a great opportunity for me to listen and learn from the parent body – from those who appreciate or are familiar with Outdoor Education, as well as those who struggle to understand how it fits into the BGS strategic platform. I presented two slides to help articulate the aims of BGS Outdoor Education under my leadership. The parents who attended the meeting recommended that I share these with a wider audience. Here they are. Educating out-of-doors, when done well, supplements and enhances classroom learning, physical and mental health, and allows boys opportunities to discover safe personal risk thresholds and lifelong social and environmental perspectives. We aren’t running camps anymore; instead, we are facilitating educational programs – this is an important distinction. I believe that a well-structured learning sequence of experiences that utilise educational journeys through natural environments, often with adventurous activities as mediums for those journeys, will have a lasting positive influence on the lives of our boys – even for the least ‘outdoorsy’ boy. 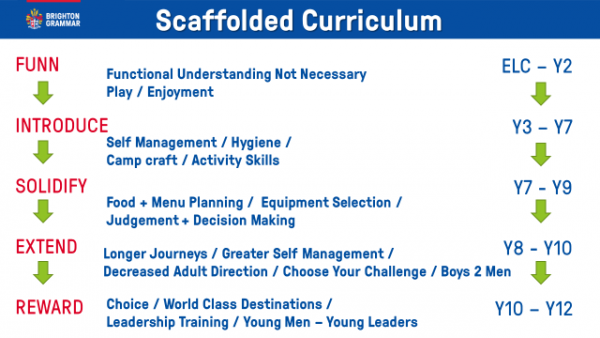 The curriculum starts with a focus on enjoying the outdoors and a basic introduction to camp craft and activities. As the amount of time spent under canvas increases, so does the boys’ skill acquisition, testing and challenge. They progress through a series of programs designed to ‘prove’ to them that they now have what it takes to successfully and safely undertake some seriously adventurous journeys, such as trekking the Kokoda Track or ski touring and snow camping in New Zealand. For selected Year 11 students, the Outdoor Education Leaders Program is a three-term commitment to service-based leadership through the outdoor education learning sequence. If your son is in Year 9 or Year 10 and interested in such an opportunity, please be in touch for further information. The Outdoor Education office is located beside the Uniform Shop in Rosstrevor and our door is always open to parents, staff and students. Together with the rest of the team – Nathan (Assistant Head of OE), James aka Metro, and Carly (Program Coordinators) – I look forward to our next shared adventure.